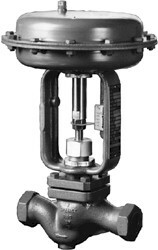 The compact Type J Control Valve offers you greater performance at a competitive price. Featuring a compact, efficient design, the Type J Control Valve provides greater flow capacity and performance than most comparable models, yet is economically priced. Special features range from a streamlined bodythatminimizesturbulence and pressure drop to erosion-resistant hardened stainless steel trim. You can select from multiple port sizes and flow characteristics. The 36 and 60 square inch actuators are field reversible. Using the same parts, you can quickly change from reverse to direct action. In addition, interchangeableactuator sizes are available to meet varying operating conditions. Long service life is provided through closely guided low-friction internal parts, erosion-resistant material and other special design features. Designed for industrial, commercial and institutional applications, the Type J Control Valve is used for steam, air, water, oil and other fluids. Process control systems for food, pulp and paper, chemical, petro-chemical and other industries. Heating, ventilating and air- conditioning systems. Packaged systems such as heat exchangers, water purfication systems and vaporizers, metal cleaning and plating applications. Feed water and fuel system controls in boiler rooms. VARCOfor all your Spence valve needs.